Hey guys, I am back again! This time I am with my awesome boyfriend, Pedro, who helped me shoot, edit, and choose the photos. 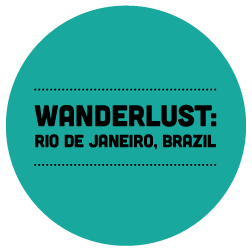 We have a WANDERLUST post for you. Part II of our Brazil trip - the amazing Rio de Janeiro! After 10 days in beautiful Salvador (read about Part I of our trip to Salvador, Brazil), Pedro, Sonia (Pedro's lovely mom), and I headed out to Rio de Janeiro for some sightseeing, and to visit with Pedro's grandmother. Rio is an amazing city full of history, culture, and of course - some very famous beaches! Unfortunately it rained almost every day for the whole 10 days we were in Rio... So the dreams I had of getting a tan on the beaches of Ipanema were pretty much shattered. Haha. But don't worry - we managed to occupy ourselves and have a great time! We visited the Sugar Loaf ("Pao de Acucar"), where we took two cable cars between neighbouring mountains and went on a nature walk. We tried to go up another mountain to see the statue of Christ the Redeemer ("Cristo Redentor"), but once halfway up - decided the 4 hour wait was no way to spend an afternoon (and to be honest, you can "see" the statue from literally anywhere in the city). We also visited the Botanical Gardens (Jardim Botanico), and enjoyed some of the local nightlife. We listened and danced to samba and bossanova - and heard the samba schools practicing for Carnival. Rio de Janeiro is such a vibrant city. If you ever have the opportunity to visit, I urge you to take it. I can't wait to see more of the country, and explore other parts of South America. Thanks for letting me share a tiny bit of my first South American adventure with you! Check back next Wednesday for more of my travel adventures! Who knows where I will stop next. View from the cable car at the Sugar Loaf (Pao de Acucar). Christ the Redeemer Statue (Cristo Redentor) through some trees, Pedro & I in an old cable car at the Sugar Loaf (Pao de Acucar). MONKEYS!!!! With their tails touching! I died (@ the Sugar Loaf). Mama monkey with a Baby monkey on her back :D (I believe this was on the road back down from the Christ the Redeemer statue), Crazy flower in the Botanical Garden (Jardim Botanico). View from the restaurant called, Apazivel (apparently Amy Winehouse ate here when she spent time in Rio - so I thought that was pretty cool), in the Santa Teresa neighbourhood of Rio de Janeiro. Wish I had gotten to spend more time in this lovely little area. Jardim Botanico/Botanical Gardens, We stopped on our drive through the mountains, and I snapped a quick photo. Me enjoying a caipirinha (cachaca + lime + sugar + ice) at Rio Scenarium, Live band at Rio Scenarium. Street art near the Botafogo subway station! There was so much AMAZING street art in Rio. I am so sad I didn't take a million photographs of it.